Kraft Foods is one of the largest food companies in the world, with many $1 billion brands. Its “blue box” macaroni and cheese product is a perennial favorite. Made simply at home, the macaroni and cheese product consists of dry macaroni with cheese sauce mix. 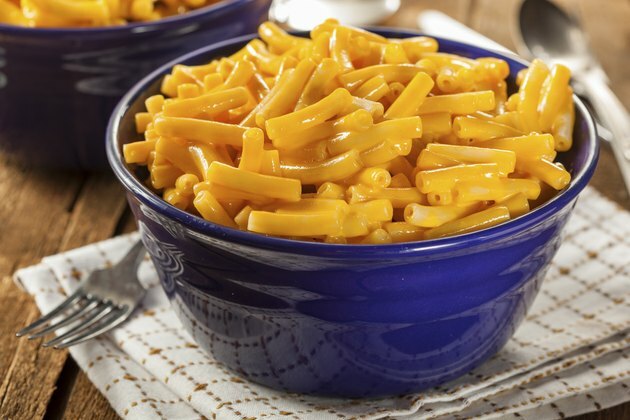 The macaroni in Kraft Macaroni & Cheese is an enriched macaroni product. It's made from wheat flour, to which the B vitamins niacin, thiamine mononitrate, folic acid and riboflavin have been added. The macaroni is also enriched with iron in the form of ferrous sulfate. Every package of Kraft Macaroni and Cheese contains a package of mix to make cheese sauce. The cheese sauce mix contains several milk ingredients: whey (milk protein), milk protein concentrate, milk, milkfat and cheese culture. The cheese sauce mix also contains salt, sodium tripolyphosphate, sodium phosphate and calcium phosphate. According to the International Food Additives Council, sodium phosphates help cheese retain its melting properties and calcium phosphate improves nutritional value. Yellow 5 and Yellow 6 are added to the sauce mix as colorings. Final ingredients in the sauce mix are citric acid, lactic acid and enzymes. According to the Food Additives and Ingredients Association, acids are added to foods as preservatives and emulsifiers. Enzymes are catalysts, and may help the cheese sauce reconstitute properly. When making Kraft Macaroni & Cheese, add your own butter or margarine and milk according to package directions. The products you choose affect the overall calorie count and nutrition of the product.